After some early morning losses, oil prices reversed yesterday to trade nearly flat to Friday’s close. This morning, prices are generally making their way towards higher ground, supported by crude production outages in the Gulf Coast due to Hurricane Matthew. 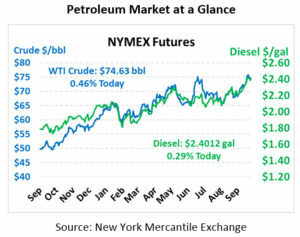 Crude prices this morning are trading at $74.09, a gain of 34 cents since yesterday’s close. Fuel prices are mixed this morning, with diesel still the stronger product. Diesel prices are $2.4012, up 0.7 cents since yesterday’s close. Gasoline, which saw larger gains yesterday, is currently trading at $2.0790, down 1.5 cents. Markets are cooling off a bit after recent comments from the Trump administration that the US could issue sanctions waivers to some countries that will continue trading with Iran. Although waivers have always been a possibility, National Security Advisor John Bolton reiterated on Friday that the current policy is applying “maximum pressure” on Iran, implying no waivers. On the demand side, the IMF recently downgraded US GDP forecasts in 2019 from 2.7% growth to just 2.5%, citing trade barriers as a key reason. This forecast comes amid speculation that developing economies will experience much slower growth in 2019 as a result of a strong US dollar and high oil prices. The combined effect of slower growth in 2019 will be reduced oil demand, which could cause oil prices to fall without a corresponding reduction in supply. Yesterday we noted that Irving’s Saint John refinery in New Brunswick experienced a fire that caused operations to shut down. Current data show ample supply in the US Northeast, so the short-term impact should be minimal, but if the refinery reports extended damage then gasoline supplies could grow tighter over the next few months. So far, Irving has not provided an official statement on the damage or the plant’s operational status. 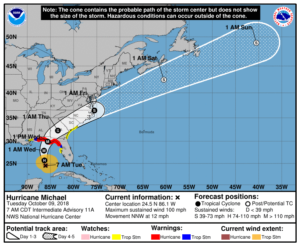 Hurricane Michael has strengthened to a Category 2 storm, and forecasters expect it could briefly attain Category 3 level winds (making it a Major Hurricane) before landfall. Florida has declared mandatory evacuations in the Panhandle region, impacting roughly 120,000 residents. Alabama has now also declared a state of emergency. Mansfield is currently at Code Red for the Florida Panhandle and Tampa markets, and Code Orange for the rest of Florida, Alabama and Georgia. The storm is moving very quickly, which has pros and cons. Unlike slow-moving storms such as Hurricane Florence earlier this year, fast-moving storms have less time to dump rain in one area, reducing the risk of flooding. Forecasts show the Florida coastline receiving roughly 12 inches of rain, a far cry from the 2-3 feet experienced in the Carolinas. However, a fast-moving storm will have a strong effect further inland, bringing tropical storm winds throughout the Southeast. 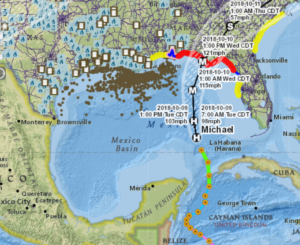 Although markets are concerned about the effects of Hurricane Michael on crude infrastructure, the current path of the storm puts it to the east of most drilling platforms in the Gulf Coast. While the storm could pull westward and cause further damage, current projects showing it just lightly impacting crude drilling operations – meaning that production can resume shortly after the storm passes. Still, with roughly 325 kbpd of production currently shut in, expect next week’s EIA inventory numbers to reflect several days of lost crude production.